Mona is friends with Jay and Kat, and she is the Mom friend of the group. Mona is very positive, upbeat and friendly. She works as a barista and cashier at the same Cafe as Jay and Kat, having helped get both of them a job there. Mona loves to wear pastel and bright colours and spends a lot of time straightening her curly hair. Mona is very flexible and adapts well to new situations. She does her best to keep people happy and smiling, and always keeps a smile on her own face as well, sometimes ignoring things that might make her upset. 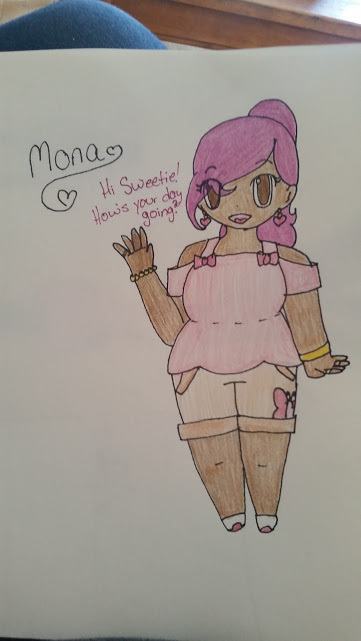 Mona loves to go to the movies and her biggest pet peeve is when people tease her about her height.